Is damp or poor ventilation ruining your home? As building surveyors we often get calls from concerned tenants or homeowners who fear they have discovered damp in their property. Upon closer inspection by a professional eye, the suspected damp can often turn out to be issues resulting from excess condensation or humidity from poor ventilation in the building. Luckily, this is much easier, and less costly to rectify than a case of damp. Poor ventilation can cause more problems that you might imagine and here we look at one particular case that highlights some unusual consequences that can occur if fresh air isn’t able to circulate properly throughout your property. The homeowner had a raised and bumpy living room carpet – they called us concerned that damp in the flooring beneath the carpet was the cause. During a site inspection, our Chartered Building Surveyor pulled back the carpet and thoroughly assessed the area for moisture using both his hands and a damp reading device. It became evident that the woodblock flooring had lifted away from the concrete slab below to cause the bumpy effect you see in the carpet. There was however, no unusually high readings of moisture detected to indicate the presence of damp in the flooring. As our surveyor viewed the rest of the property, it became clear that high humidity levels, due to poor ventilation had caused the woodblock flooring beneath the carpet to expand and lift to create the problem illustrated above. In the case of this example, the homeowner had a large proportion of fixed, un-openable windows in the property and the windows that did open, were obscured by net curtains and rarely used. This meant that moist and warm air from the bathroom & kitchen was unable to leave the property and encouraged mould growth that was seen on window frames, sills and furniture. In this case, the lack of ventilation also caused the expansion and movement of flooring materials in the living room. By following our simple tips below you will ensure your home remains well ventilated and air is able to circulate freely. This, in turn will reduce the chance of creating an environment that encourages mould growth so you can rest assured you’re living in a healthier home. Keep all windows that can be opened ajar whilst you are out. Most modern windows have a setting that allow them to be locked with a small gap left for ventilation. This means your home remains secure but ventilated while you are out. As often as possible, open all windows as wide as possible to encourage through-flow ventilation. At the same time open all internal doors to enable fresh air to circulate around all rooms. Whenever you open windows pull any netting or blinds out of the way to allow maximum air circulation. Clean windows and sills, including glazing and framework, with an anti-bacterial spray. This will remove the mould and prevent further growth. Re-locate your kettle as close to the kitchen window as possible and open the window whenever you use it. Doing so will prevent steam (hot and moist air) collecting in the room. When cooking, close any doors to connecting rooms and open the kitchen window to direct steam out of the house and not allow it to travel to other areas of your home. Install an extractor fan or ensure you have working window in the bathroom. You can set extractor fans on timers. This can be linked to shower use or when you turn on the light for example, meaning you don’t have to remember to turn it on and you also don’t waste electricity if you forget to turn it off. Always ensure extractor fans are fitted by a qualified electrician. 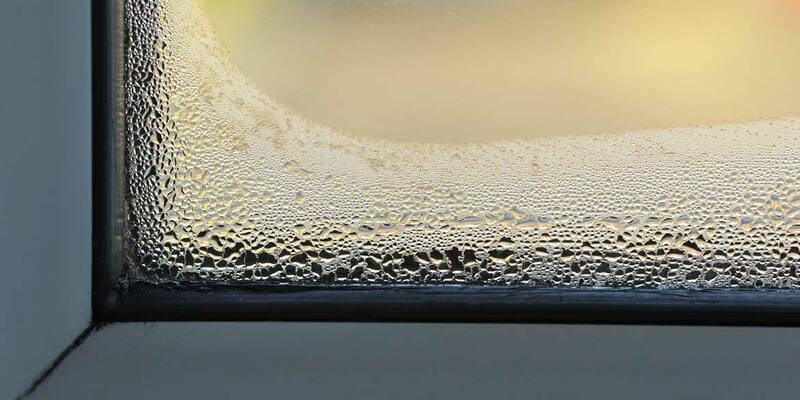 If you have trickle vents on your bathroom windows, leave them open. Look out for these when installing new windows for kitchens and bathrooms. After using the bath or shower, keep the door of the bathroom shut for at least 30 minutes after you have drained the water. This will encourage the hot and moist air to escape via the trickle vent, extractor fan or window and prevent the hot air from passing into the corridor and spreading throughout your home. If you think you have a damp, condensation or humidity problem, please get in touch with our Chartered Surveyors. We will be happy to advise either on the telephone or following an inspection of the property to give you peace of mind.